The legal and regulatory framework for the availability of information in Morocco is generally in place. However, deficiencies have been identified regarding the availability of ownership information for bearer shares, and for non-resident companies and partnerships. The report also found that some penalties to enforce the obligation, for limited companies, to maintain a share register and the obligation, for companies, to file and keep the originals of correspondence received and copies of correspondence sent are missing. Recommendations were made to address these issues. The Moroccan tax administration has sufficient powers to gather information for the purpose of exchange with treaty partners, however, there is no provision in Moroccan domestic legislation that preclude the application of professional secrecies and allow tax authorities to access information from notaries and statutory auditors. A recommendation was therefore made for Morocco to address this issue and another recommendation was made for Morocco to restrict the scope of the protection under the term “professional secret” in its domestic law. Finally, Morocco has a very good network of exchange of information agreements which covers 106 jurisdictions. 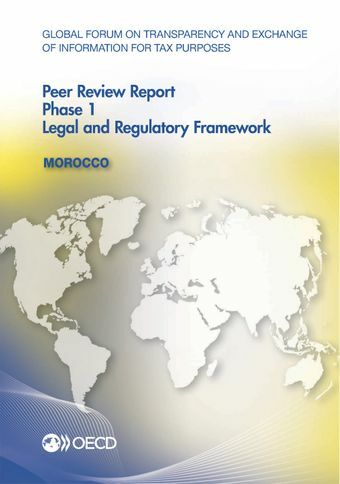 Morocco’s response to the recommendations made in this review, as well as the application of the legal framework and the implementation of the international standard in practice, will be considered in detail in the Phase 2 review of Morocco, which is scheduled to commence in the second quarter of 2015. For further information on the exchange of information practice of Morocco and to read the full report click here.